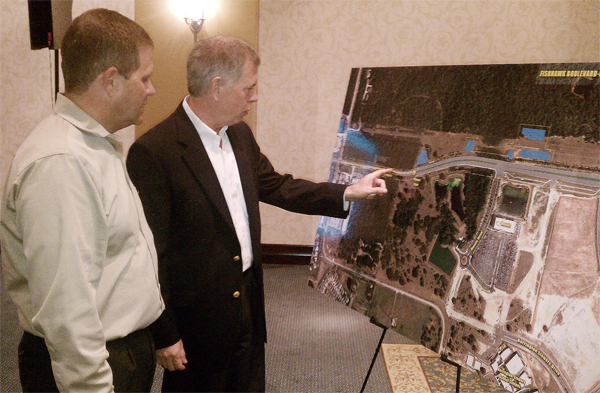 FishHawk resident David Nicholson, left, gets some explanation from Newland Communities Tampa North Vice President and General Manager Tom Panaseny about the FishHawk Blvd. widening project now marked by the orange barrels from West of Mosaic Dr. to Little FishHawk Creek. It was only a matter of time before motorists would see the orange construction barrels along FishHawk Blvd., signaling the start of the long-awaited road widening project. To some it is a sign of future relief from congestion, but to many others it is also the time to brace for more lane closures and further delays before things get better. Newland Communities Tampa North Vice President and General Manager Tom Panaseny was pleased to explain the order of project progress during a recent public meeting held in connection with the three-phase project, first of which (Phase I) encompasses a one-mile section of FishHawk Blvd. from West of Mosaic Dr. to Little FishHawk Creek. Led by Project Manager Marty Sanchez, P.E, the prime construction contractor bid went to RIPA & Associates, while the construction engineering and inspection (CEI) is handled by Genesis Group with the estimated completion date of next summer. Designed by Heidt Design, LLC, this first segment will widen FishHawk Blvd. from the existing two-lane road to a four-lane divided highway with varied landscaped medians. It will also include an eight-ft. wide multi-purpose path along the south side of the road. The meeting also addressed two additional simultaneous projects by Newland Communities with completion dates similar to FishHawk Boulevard Phase I. Also being completed by RIPA & Associates under contract with the Circa FishHawk Community Development District, this project will provide a new ingress/egress point for the existing schools and Mosaic Headquarters, in addition to those located along FishHawk Blvd., Panaseny said. The third and possibly the most anticipated project mentioned during the meeting was the previously promised FishHawk Crossing Blvd. and FishHawk Blvd. traffic signalization. Panaseny was pleased to announce that the approval process for the signalization, which will include a signal with left turn lanes and a dedicated pedestrian cross walk, is now underway. “The design is 90 percent complete and will be reviewed by Hillsborough County for final approval within the next 30 days,” he said. This project has been delayed in the past due to the proposed location of the traffic signal mast arms, which fall directly underneath the TECO transmission lines that exist above this intersection. This project completes the list of things for now and is anticipated to be complete and operational by the end of April 2011. For additional questions and up-to-date project information, please contact Marty Sanchez, 741-2670 or e-mail msanchez@gencei.com.